Let The Mustache & Milkshake Party Begin! Nothing goes down better after a good pillage than a milkshake! 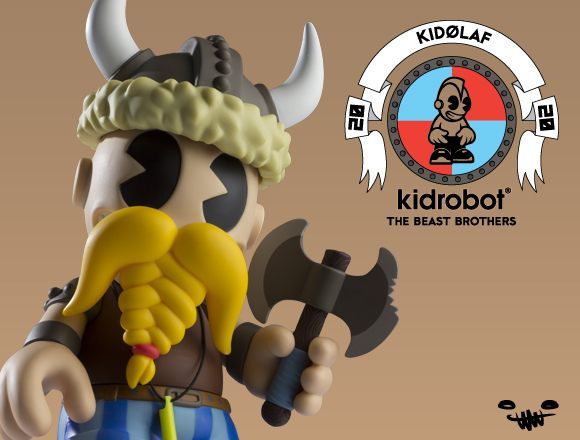 At least, that’s how the newest 8-inch Kidrobot figure sees it. Stepping out from their traditional Mexican roots, the ultra-talented Beast Brothers bring us KidØlaf – the Scandinavian TechnoViking, who, like every plunder-loving brute, “Loves Raves, Milkshakes and Pillaging.” Inspired by the Internet phenomenon and viral video of 2007 (google now), each techno-loving ‘bot features a rakish braided beard and comes with a horned helmet, glow stick, milkshake and trusty battle-axe. The 1 in 6 chase features an alternate colorway, but comes with all the essential Viking tools for sipping sweets and pillaging villages. Available now for $50.00 (£40.10 UK; 46.50 € Europe).